The Miss Chinese International Pageant 2016 was held last night. Vancouver’s Jennifer Coosemans (朱亞琳) took the crown, while New York’s Mary Chen (陳舒菲) and Sydney’s Tiana Luan (欒添) won first runner-up and second runner-up respectively. A standout beauty, Jennifer Coosemans was the media’s favorite since the start of the pageant. Last night, Jennifer impressed judges with her athleticism with a cheerleading stunt in the talent segment. Aspiring to pursue a law degree, the 21-year-old speaks English, Mandarin, Cantonese, Shanghainese, and French. Her interests include hiking, water sports, playing the piano and trombone. First runner-up, Mary Chen, is an 18-year-old college student who hopes to achieve success in her career. Her interests include baking, painting, photography, and playing the piano. Mary is fluent in Mandarin and English. 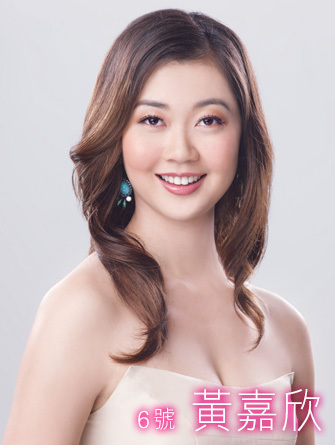 Second runner-up, Tiana Luan, is a 23-year-old student who aspires achieve success and influence in society. Fluent in Mandarin and English, Tiana enjoys singing, playing the piano, dancing, painting, swimming, and weight lifting. Los Angeles’ Alice Wong (黃嘉欣) won the Miss Friendship award. The 23-year-old currently works as a Data Analyst, but hopes to become an action and comedy star. Fluent in English, Mandarin, and Spanish, Alice enjoys playing basketball, hiking, running, cooking, swimming, cooking, and listening to music. When the top five contestants were announced as Bangkok’s Mint Kongraphan (陳思敏 ), Nanjing’s Sophia Wu (巫雪菲), New York’s Mary Chen, Sydney’s Tiana Luan, and Vancouver’s Jennifer Coosemans, it was a surprise that Hong Kong’s Louisa Mak (麥明詩) failed to secure a spot. In the past three years, Hong Kong contestants have achieved good results in the Miss Chinese International Pageant. The pageant’s MCs included Carol Cheng (鄭裕玲), Lawrence Cheng (鄭丹瑞), and Luisa Maria Leitao (黎芷珊). The male celebrity judges included: Alex Fong (方力申); Pakho Chau (周柏豪); Ruco Chan (陳展鵬), Lai Lok Yi (黎諾懿); Sammy Sum (沈震軒); and Alfred Hui (許廷鏗). The beauty judging panel consisted of 20 female artistes: Oceane Chu (朱璇); Christine Kuo (苟芸慧); Gloria Tang (鄧佩儀); Grace Chan (陳凱琳); Kayi Cheung (張嘉兒); Veronica Shiu (邵珮詩); Carat Cheung (張名雅); Janet Chow (周家蔚); Jacqueline Wong (黃心穎); Sisley Choi (蔡思貝); Erin Wong (王卓淇); Jacqueline Chong (莊思明); Whitney Hui (許亦妮); Tracy Chu (朱千雪); Katherine Ho (何艷娟); Samantha Ko (高海寧); Phoebe Pang (彭慧中); Mayanne Mak (麥美恩); Jennifer Shum (岑杏賢); and Roxanne Tong (湯洛雯). I personally think Louisa has lost the media hype around her background and her ‘sparkle’, it’s almost like she didn’t really want to be there last night, but that’s just my opinion. Jennifer and Tiana looked so pretty throughout the night! But it’s obvious that Jennifer had some favourism from the glamour panel as so many of them are originally from Vancouver like herself. The whole thing is rigged and about favoritism. There’s no legitimacy in pageants. @anon I believe this one is not. If it is they woulda make Louisa top 5. It just happened the prettiest girl is from Vancouver. Guys Jennifer is absolutely so pretty! She reminds me of Michelle Reis with that classic look. You know I haven’t seen a miss HK or miss Chinese international with this kind of look for a while now. Every girls look the same nowadays so I’m so happy that she won! I hope she makes a big name in HK. We needed it (so we can’t stop dwelling to the past a little bit lol). 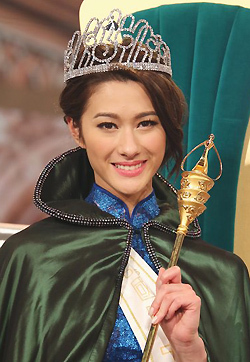 Excited to see her on TVB screen and eventually replaces Grace! @kaykay408 To: Kaykay408- that is not true that Jennifer, is (not) prettiest girl is from Vancouver (during January 2016), that is your opinion and not fact. By the way, she is not geniune Chinese. Michelle Reis, 46 looks okay but is not classic, and should not be used to encourage whitewashing in a bad way. Western people support only their western women, whether lovely or ugly, in their pageants are careful not to mention the beauty of various Chinese Asian girls. @mayxiang of course, this is just my opinion. I totally didn’t say anything about “whitewashing”. Not sure if my post causes you to think that but I didn’t even think about them being mixed or what not. All I’m saying is she’s a unique beauty and I admire that. And again, it’s just my opinion. @kaykay408 She does remind me more of Michelle Reis than Grace does. For one, both Michelle and Jennifer are around the same height (5’7″-5’8″) and both kind of them kind of give off the same appeal. I think because Grace is short and petite, she gives off more of the “cute” feel. To: kaykay 408 – Jennifer looks okay but is not pretty, not classic look as in the winner of this pageant in 2016. That caucasian actress looks ugly and those slutty caucasian pin up women have nothing to do with this contest in Hong Kong. Also, with the judges being from Vancouver, it is obvious she got favourtism during January 2016. The panel of judges are mean in 2016 and any viewers who eliminated some of the more authentic Chinese girls who should have received either 1st, 2nd or 3rd place in 2016. Jennifer was born in Canada and had the benefit of her one of her parents teaching her Chinese. Also, Canadian-Chinese born people in Canada, the ones who claim to can speak 2 or 3 languages are NOT truly fluent in all 3 languages, and usually fluent in one. Some people who are smarter that are much more fluent in one particular language. However, immigrants, some who move to Canada as adults of different ages, are more fluent in 3 or 4 different Asian Chinese languages. Jennifer is not appropriate for Miss Chinese Vancouver Pageant, and is not the best, should not the rightful winner of this Miss Chinese International contest on January 23, 2016. Women who are fat or average weight (not slim) may have bigger busts and women who are slim often or almost always do NOT have more cleavage (do not), unless they use digital enhancement. Some pageant statistics that do sound out of place, are misleading and not correct because she was wearing a padded push up blue bikini bra and extra thick padded bra (in front of her dark strapless dress) to make her chest appear falsely bigger. The wínner of this Miss Chinese 2016 pageant, bust =34′ (NOT 35′), has a wider band size, (not that slim for waist size) waist is 26.5″ (not 25″), and hips =one inch more than 36 inches (hips/buttocks). Some of the other Asian Chinese contestants with 33“, 23 ½ “,. 33 (or 32“, 24, 33) are prettier than the person who was announced as the winner of this 2016 Chinese pageant. She looks pretty, elegant and,classy which is difficult to find these days but she is not exquisite beauty or such. Cant have it all. Is she Chinese? If she isn’t, how can she be Miss Chinese International? Not a racist question btw, just a genuine question . she could be 1/2 or 1/8 Chinese. @msxie0714 She’s 1/2 Chinese and 1/2 Belgian. She looks more Chinese to me, but that could be because I am mixed myself and look more White. Another question- can she speak Cantonese or Mandarin as reported in this article? Didn’t have time to watch the contest but those parts i caught, some contestants spoke in English. As for Jennifer she spoke in English in an interview I watched. Although not the prettiest woman ever or anything, Jennifer was definitely the prettiest girl out of the competition (at least to me anyways). The other girls looked really average to me. Some are “cute” at best. Haven’t watched the competition yet though so I can’t completely judge. This assessment is just based on all the pics I’ve seen of them. Jennifer is very pretty but I thought her cheerleading routine was pretty basic for international competition. I don’t know what the fuss is about other than the cartwheel and split at the end. @smurf ikr. Even before they announced what she was going to perform, i already half expected that. Her routine was nothing exceptional.